30cm Cargo Basic waste bi.. The Cargo Basic waste bin may be basic in name, but it certainly isn’t basic in nature. This cleverly designed disposal unit features two large separate compartments, including 1 x 15 and 1 x 10 litre bin, making it ideal for both mixed recycling and general waste. Housed within a sleek silver-colour steel holder, the Cargo Basic waste bin is both functional and contemporary. Amongst its enviable design features is a metal system lid, which doubles up as a shelf for extra storage. 30cm CargoSoft G waste bi.. 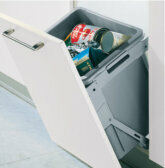 Convenient and innovative, the CargoSoft G waste bin is the perfect addition to any kitchen. The unit houses two separate compartments totaling 25 litres, ideal for recycling and general waste disposal, and can be either mounted to a side wall or used with your kitchen cabinet. The CargoSoft G’s clever design enables its lid to be used as an extra storage shelf by remaining in your cabinet even when the bin is withdrawn. 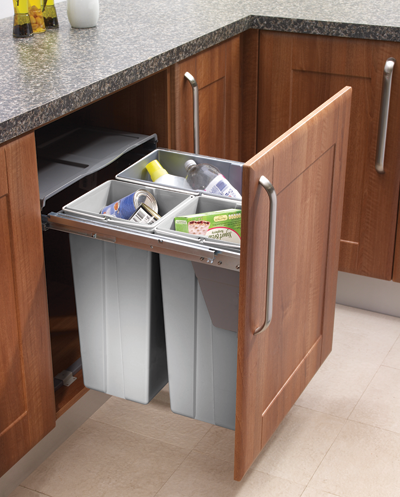 The Euro-Cargo S waste bin provides a smart and effective way of reducing clutter and maximising storage space in your kitchen. The Euro-Cargo-S provides ample room for your discarded waste with a single 30-litre compartment, which fits neatly into your ccabinet. 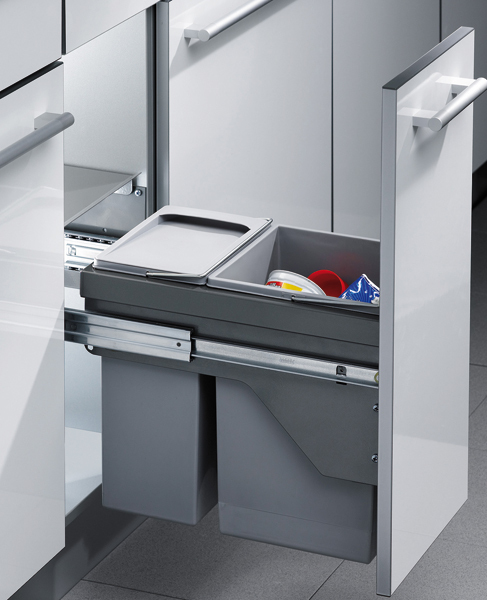 The waste disposal unit’s unique and contemporary design also enables its lid to remain housed within your cabinet even when the bin is withdrawn, meaning it can be used as a functional shelf to maximise storage. 45cm Euro-Cargo 45 waste .. The Euro-Cargo 45 waste bin is an innovative waste disposal unit designed to hold 70 litres. 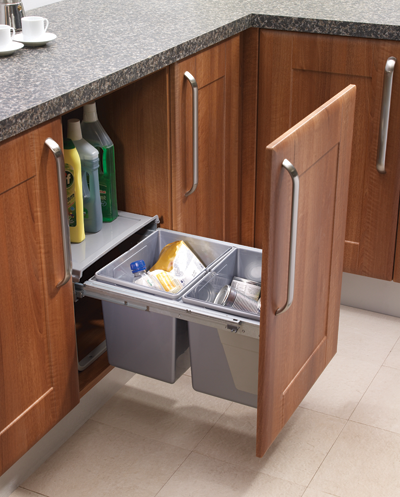 2 X 35 litre waste bins make the Euro-Cargo 45 an ideal choice for your kitchen by freeing up valuable space. 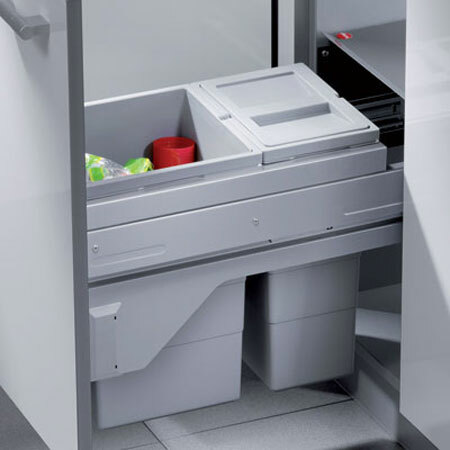 The Euro-Cargo 45’s unique design enables the unit’s lid to remain inside your cabinet when withdrawn, meaning it can be used as a functional shelf to maximise storage. 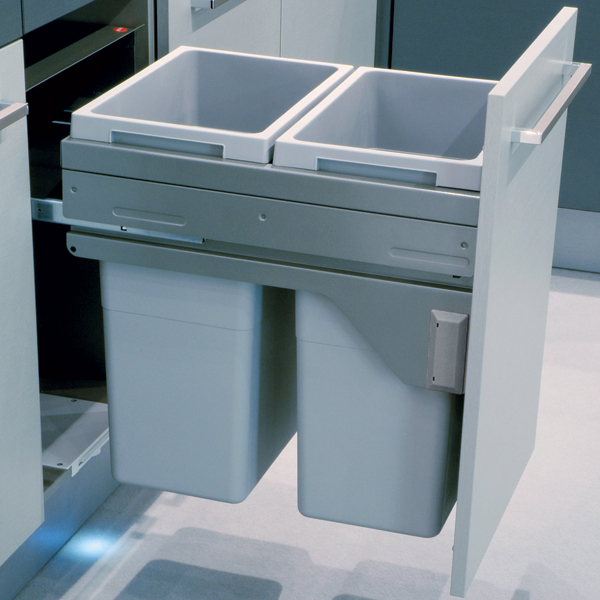 Allowing you to neatly tuck your waste away out of sight even in tight spaces, this bin is designed to fit into cabinets with restricted internal height. 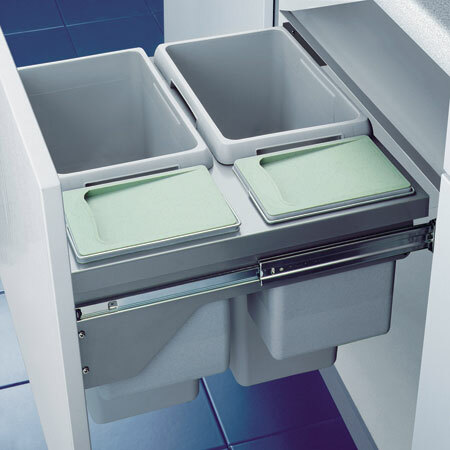 Whether you need it to fit under a cabinet shelf or underneath sink plumbing, this bin is easily installed and can be mounted inside a cabinet or behind a standard hinged door. Comprised of 2 x 15 litre capacity containers with integrated handles for easy bag removal, this bin benefits from soft closing action and full extension. 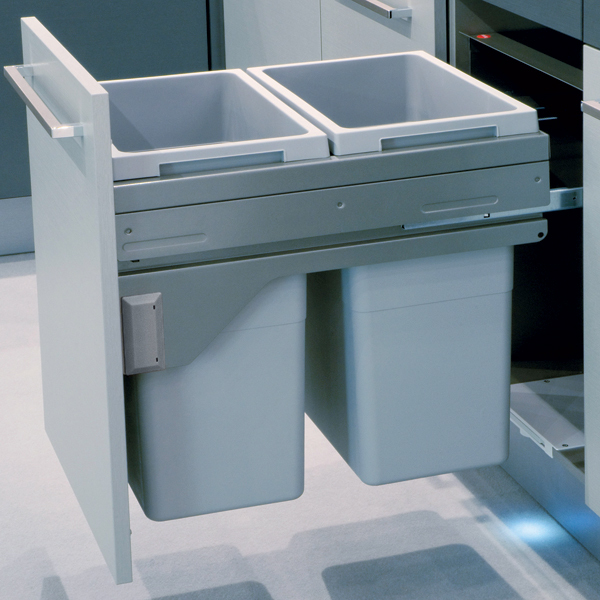 Whether you are considering installing your waste system in a convenient drawer or in a kitchen cabinet, keeping your bins out of sight is the number one priority. 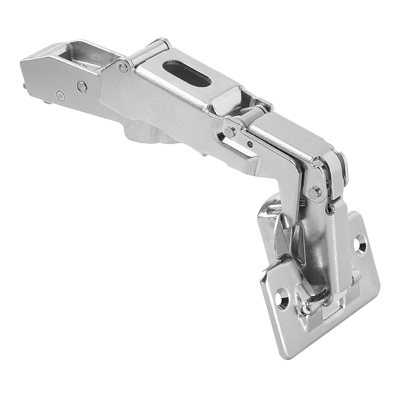 This waste and recycling system allows you full extension with side mounted runners and benefits from integrated plastic formed fixed lids and handles. Storage and waste management has never been easier. 50cm Euro-Cargo 50 waste .. The Euro-Cargo 50 waste bin is an innovative waste disposal unit designed to hold 70 litres. 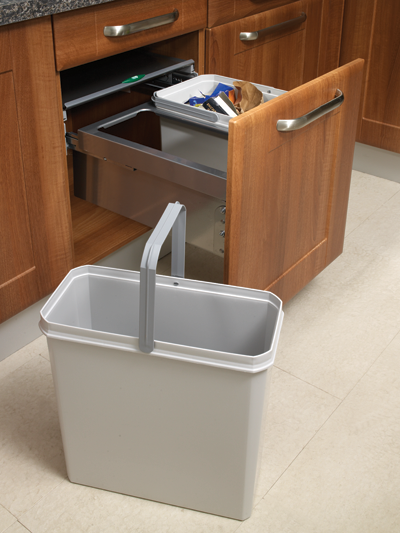 2 X 35 litre waste bins make the Euro-Cargo 50 an ideal choice for your kitchen by freeing up valuable space. 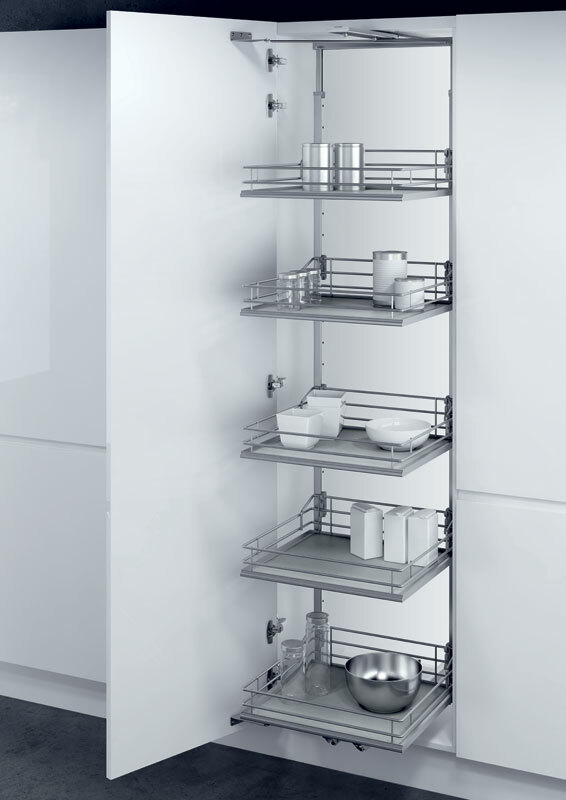 The Euro-Cargo 50’s unique design enables the unit’s lid to remain inside your cabinet when withdrawn, meaning it can be used as a functional shelf to maximise storage. 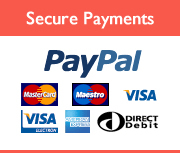 If you are looking for the best in recycling and waste bin systems, this deluxe model is the right option for you. Suited to a 500mm wide cabinet, this system is mounted on both sides with full extension soft close runners and a fixed pressed steel lid capping off the containers when the bin is closed. Designed for easy removal and carrying, this system is comprised of 1 x 28 litre and 1 x 21 litre containers. In-drawer waste and recycling storage is ideal for most homes – by keeping your waste tucked away out of sight and preventing mess and spillage you can help to keep your kitchen clean and tidy. This system is perfect for installation in most kitchens, and benefits from full extension side mounted runners, integrated plastic formed fixed lids and integrated handles for easy removal and changing of bin bags. If you are looking for a neat, tidy and hygienic storage solution for your waste and recycling, consider an in-drawer waste management system. This bin benefits from full extension side mounted runners, integrated plastic formed fixed lids and integrated handles for easy removal and changing of bin bags. Take control of your kitchen cleanliness and put this bin system to work for you. 60cm Euro-Cargo 60 waste .. The Euro-Cargo 60 waste bin is an innovative waste disposal unit designed to hold 84.5 litres with the help of four separate compartments. 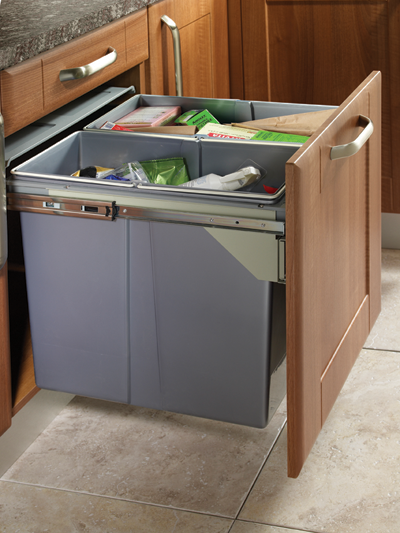 2 X 35, 1 x 12 and 1 x 2.5 litre bins make the Euro-Cargo 50 an ideal choice for your kitchen by freeing up valuable space. 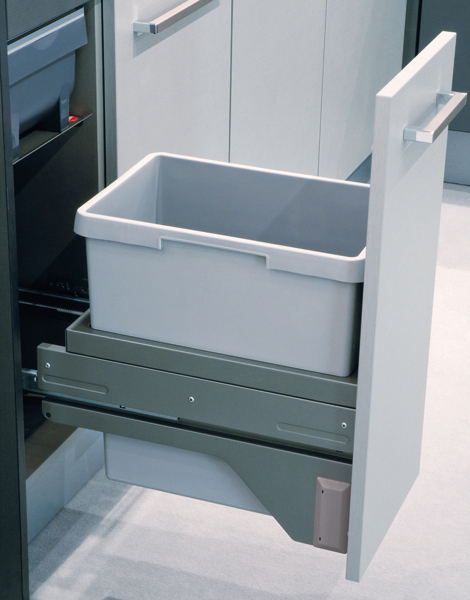 The Euro-Cargo 50’s unique design enables the unit’s lid to remain inside your cabinet when withdrawn, meaning it can be used as a functional shelf to maximise storage. Do you need a lot of space to store your rubbish and recycling? This large waste bin storage system is perfect for homes that generate high volumes of trash – one 34 Litre bin sits snugly behind 2 x 17 Litre bins, all of which are easy to remove and clean. Coloured integrated handles make sorting the trash a simple task. Tilting waste bin 30 Litr..